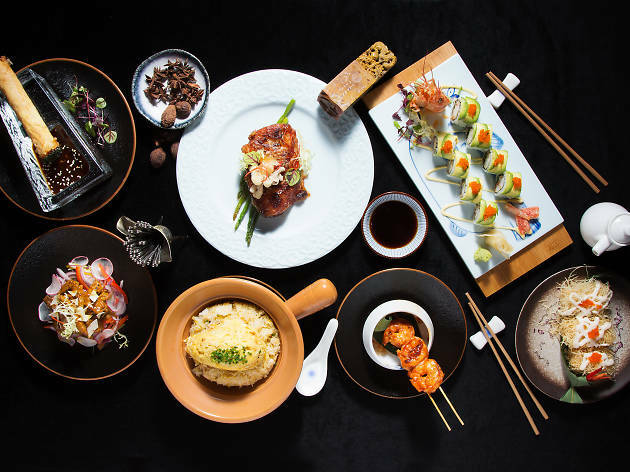 The newest addition to Lan Kwai Fong, Fang Fang has a broad pan-Asian menu that’s rich and diverse. With experienced names from Hong Kong and abroad heading the bar and kitchen, both food and drinks consistently deliver. 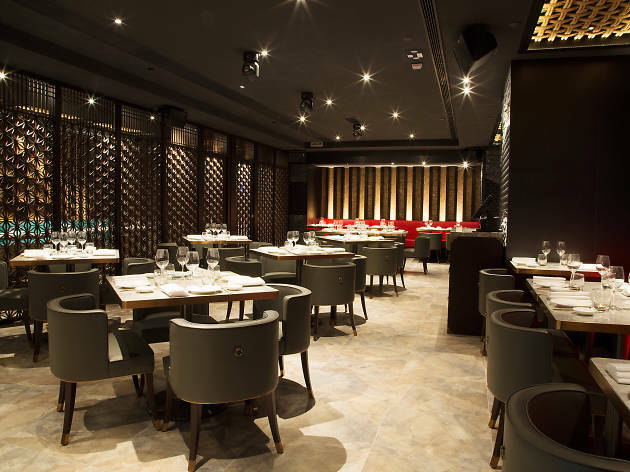 Occupying the former Casa Lisboa spot in LKF Tower, Fang Fang is a spacious, chic space with touches of Asian flair. There’s one of those now compulsory half-baked fictional backstories (thanks Mrs Pound, Foxglove et al) claiming the restaurant is named after a mysterious Chinese opera singer, but that’s of little interest compared to who’s running the show. 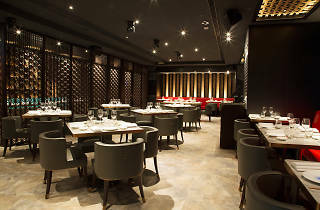 The kitchen is helmed by chef Kent Lee Chin-heng, formerly of Hakkasan Mumbai and London’s Kai Mayfair, while the bar is managed by Gagan Gurung, who earned a stellar reputation during his time at Zuma. Quite the formidable pair when it comes to contemporary Asian cuisine and cocktails, then. Settling in for a drink first, we start with an Omikuji Girl, a mix of chilli tequila, barley sochu, yuzu, cardamom, shiso and five spice powder that comes served in a cup shaped like a female doll. A fragrant and spicy lass, the well-balanced ingredients and aesthetic appeal make for a fine combination. The Trai Dat, is an even cuter drink served in a panda-shaped vessel. The adorable cup is filled with turmeric gin, coconut milk, pineapple, lemon and ginger. The result is a tropical drink much like a pina colada with a Thai twist. Another winner. Moving from bar to dinner table, we start with five spice squid and crispy kale with fish floss. The squid is perfectly tender, with just enough bounce but we long for a crispier batter with a little less salt. The kale reminds us of a very British Chinese dish, crispy seaweed, and is the perfect balance of savoury and sweet. 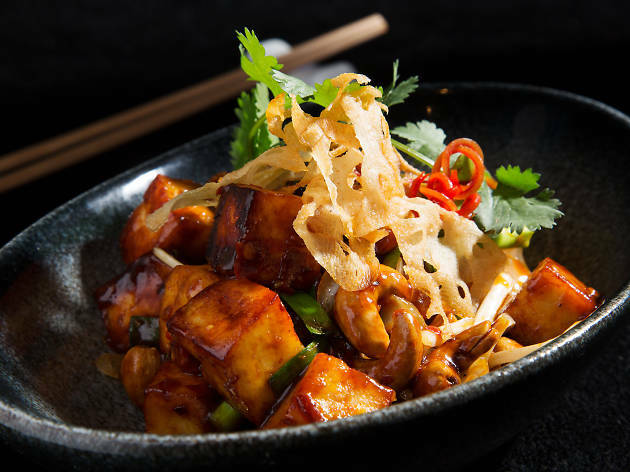 For mains, we expand our culinary horizons and select the Fang Fang style paneer and Mongolian ostrich. The bird is tender and sweet, covered in a punchy sauce accentuated by smoky chopped peppers. The paneer is fantastically buttery, with generous chunks of firm yet creamy cheese slathered in sauce and accompanied by vegetables. Both are excellent. We finish with the pandan soufflé, which is cooked to a firm texture with a toasty brown top but it lacks sufficient sweetness and depth to truly impress.